How to control recognized hazards in case of fire? This question has been asked many times by the international wire and cable business over the past decades. Besides everchanging electrical safety standards, an increasing number of new and severe flammability specifications have been released. Moreover, the industry has to meet the demand for more green products. Recently Ron Goethals of Inhol BV made presentations about the safety effects of crosslinked polymers in Düsseldorf, Germany and in Miami, FL, USA. Crosslinked wire and cable offer more safety—and that’s a fact (see www.inhol.com, presentations). Let’s face it, our earth is precious. A good quality of life is priceless. How important is it to live and work in a safe and healthy environment? We ask for cleaner air, we dream of unpolluted seas and oceans and we like to live in a greener and safer country. But how can our industry contribute to get a safer world? Every manufacturer of halogen-free crosslinked wire and cable can contribute significantly to long-term safety improvements in buildings, trains, aircraft, cars, boats and so on. It goes without saying that costs will always be a consideration in material selection. Obviously, one’s responsibilities do include the profitability of the company. However, some crosslinkable compounds for cable insulation and jacketing purposes may also offer a competitive premium and could drive change and innovation to contribute to more safety and a greener world. Crosslinked polymers offer more safety. A “simple PE” with a melting point of around 90°C to 110°C can easily withstand temperatures up to 250°C for several hours without melting—after it has been properly crosslinked. • No immediate melting means no immediate short circuits in areas like elevators, large public buildings like schools, theaters, airports, stadiums, ferries and so on. • Reduced risk of damage by mechanical pressure and cut-through, no short circuits and electrical sparking. 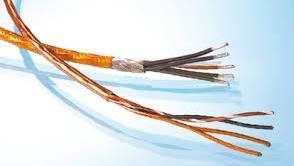 • Improved oil and fluid resistance makes the cables function longer during immersion. • Improved stress crack resistance keeps electrical circuits and their functioning in place. • No dripping in case of fire, less flame spreading, less smoke, less pollution in case of fire (see www.inhol.com, Fire). By crosslinking, polymer chains are linked together by so-called cross links. A three-dimensional polymer network is created where the molecules have been joined together into a new nonmeltable polymer system. Now, the polymer chains lose some of their ability to move as individual chains. The result is no melting. What Kind of Crosslinking Systems are Available? E-beam technology: Ionizing energy, as provided by an accelerated electron beam (EB), is an efficient means of crosslinking polymers used for wire and cable insulation and jacketing. In this process, the three-dimensional unmeltable network is produced. This can be done without heat. E-beam processing is fast, good, controllable and in a lot of cases more economical than thermal and/or chemical crosslinking. A smart solution for electron beam crosslinking has been introduced for smaller wires. This solution is a self-shielded E-beam allowing an easy installation in an existing facility. It integrates in one system the E-beam accelerator and the wire handling system, both of them being managed by a single PLC-based control system. Wires and cables that are wound on reels are fed into the E-beam and then, after electron beam treatment, are rewound onto take-up reels. This system can handle smaller cross sections and small wires. It can be installed almost anywhere in an existing facility. C.V. or chemical crosslinking:Crosslinking can also be accomplished by continuous vulcanization (CV) or chemically. Chemical crosslinking of rubber cables is called vulcanization and can be accomplished by a reaction between the polymers and a crosslinking agent by means of heat induction. For wire and cable insulations, chemical crosslinking is performed by passing the wire through a long pressurized tube, heated by steam or nitrogen called a continuous vulcanizing (CV) line. Other methods of crosslinking include salt cure and hot air vulcanization. Moisture crosslinking: Two moisture crosslinking processes are available. The first is the monosil technique, which is a single-step mixture of vinylsilane-peroxide, crosslinking catalyst and antioxidant into a polyolefin compound during a conventional extrusion process. The second is the sioplas process (a two-step process). In the sioplas process, polyethylene is first grafted with a mixture of vinylsilane and peroxide with the purpose of obtaining a crosslinkable polyethylene. The material can be either processed directly or stored in dry conditions for up to several months. In both applications, the finished product is moisture-cured (water bath or steam sauna) or ambient cured. Each of these crosslink systems have their pros and cons. How to Choose the Right System? In case you are considering crosslinking, you have to make a decision how to crosslink. Are you going for E-beam, CV or chemical? Depending on volumes, you might consider inhouse crosslinking or decide to contact an E-beam processing service provider. By E-beam, the widest range of polymers can be commercially crosslinked. The number of polymers that can be crosslinked by CV lines, chemically and moisture systems is restricted. There is a permanent requirement for quality control in the wide spectrum of crosslinked products to check custom designed material characteristics. The hot-set test (hot-creep) method is effective in determining the degree of crosslinking within 15 minutes. Alternatively, a gel-sol test method can be used. This system requires much more time. There is a direct correlation between the fast and reliable hot-set method and the gel-sol content test. The global industry is moving forward to more crosslinking and this will lead to more safety around the world. The installation of crosslink systems shows a steady, but modest growth in the USA and Europe. In the Middle East, we see more progression and in the Far East the installation of crosslink lines is still growing dramatically. Nowadays around 1600 different crosslink systems are in operation in the wire and cable and tubing industry worldwide. About 50% of all crosslink systems have been installed in the Far East. Compared to the rest of the world, we’ve found the largest number of E-beams in China (250 to 300 systems). We’ve found altogether only some 80 E-beam systems in Europe and the USA. If the world cares about more safety, the industry should think about “Crosslinking”.